Members from TU Berlin’s Database Systems and Information Management Group recently presented their research at the 41st International Conference on Very Large Databases  (VLDB’15), which was held from August 31 to September 4 in Hawai’I, USA. DIMA contributions included organizing a co-located workshop and presenting in three additional workshops. Among the attendees were DIMA’s Chair: Prof. Dr. Volker Markl, two DIMA Postdocs: Dr. Asterios Katsifodimos & Dr. Tilmann Rabl, and DIMA PhD Student: Viktor Rosenfeld. DIMA members had four presentations in three workshops. Dr. Katsifodimos gave an invited talk in the BIRTE 2015  workshop with the title: Apache Flink : Scalable Stream and Batch Data Processing. 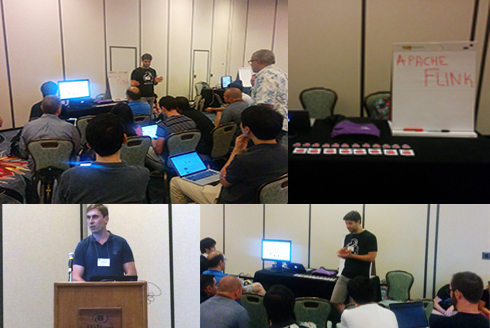 Dr. Rabl presented the papers  “Enhancing Data Generation in TPCx-HS with a Non-Uniform Random Distribution” and  “Big Data Benchmark Compendium” in the TPC TC’15  workshop and Viktor Rosenfeld presented  "The Operator Variant Selection Problem on Heterogeneous Hardware" in the ADMS workshop. The BOSS workshop  was organized and chaired by Dr. Tilmann Rabl, and provided an introduction to several active, publicly available, open source systems for big data processing. With more than 80 participants, the workshop was a great success.